Whether you’ve just purchased your first car, owned dozens of vehicles, or are somewhere in between, it never hurts to get a refresher on maintaining your vehicle! The team at University Toyota is bringing you the most important pieces of info you should know in order to make your vehicle last as long as possible. Keep reading to learn more! How often should you get an oil change? The things you hear can greatly vary. For newer vehicles, a good idea is to get an oil change every 7,500 to 10,000 miles. However, the best way to figure this out is to check your owner’s manual. With newer vehicles you can also generally trust the oil life monitor for your next change. Either way, it’s a good idea to do monthly checks on your oil level just to be on the safe side. Your tires are a vital part of keeping you safe on the road, so why wouldn’t you make sure they are properly maintained? Use the penny trick to make sure your tires have enough tread left on them. If your tires are too worn out, you’ll be able to see the top of Lincoln’s head if you place a penny head first into the tread grooves on your tire. If part of his head is covered by the tread, you’re good to go for the time being. 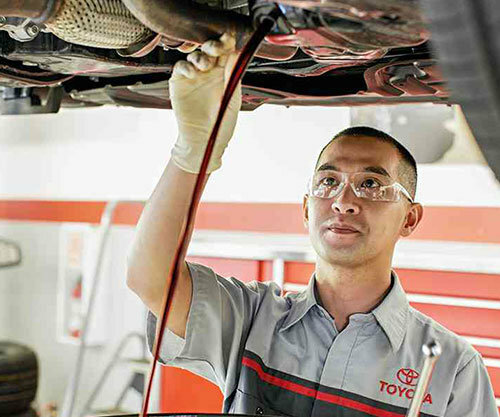 It’s important to know what your Toyota needs in terms of maintenance, and when! We’re not saying you have to know how to do all of these adjustments yourself, but knowing what is recommended for your vehicle and how often to bring it in for a checkup is significant in keeping your Toyota running for years to come. The best place to figure out your car’s maintenance schedule is in your owner’s manual, online, or by checking with our service specialists. Is your Toyota or vehicle of another make in need of some maintenance? Stop by the service center at University Toyota today. Our certified technicians can handle anything from basic oil changes to more major repairs. To schedule an appointment, call 304-296-4402 today.